A wonderful and liberating quote I read recently was “Sometimes you don’t realise the weight of something you’ve been carrying until you feel the weight of its release”. I loved this. Especially because I’m a perseverer, and I stick at things. I believe in not giving up, and I’m very loyal – to people, to projects, to possibilities. I seem to have a higher tolerance for hanging in there, when others say they would have bailed out long ago. I’m not sure this is always a virtue. Sure, sometimes it is. But other times, letting go – lightly, easily, free from resentment and stress (ah, there’s the nub of the issue – it’s not just any regular kind of letting go!) – is the wiser choice. The choice that will lead to greater happiness, greater contentment, and a surer sense of yourself. I’m in the media. 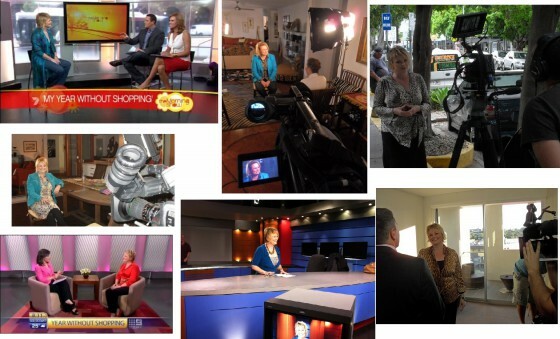 I love sharing my story and viewpoints in the media, because I get to talk to a bigger audience and reach people I will never get the chance to meet in person. There are heaps of people struggling with the same issues I have struggled with, and I believe it makes people feel less alone to hear someone talking publicly, and without shame, on an issue they share (and are perhaps keeping a secret). One of the biggest secrets to appearing in the media is it isn’t really about you – it’s about them. If you get all caught up in yourself when you’re on camera or on air or being interviewed, then it’s not much more than a nerve wracking experience. But if you think of all the people you are potentially reaching, and helping, and giving hope to, then you don’t feel so self-conscious and nervous. The focus is less on you, and more on those (through the marvellous medium of the camera and the air waves) you are speaking to.